The first Preschool Curriculum aligned to the Indigenous Education Strategy has now been implemented in all government preschools across the Territory. The Northern Territory (NT) Preschool Curriculum is linked to the Australian Curriculum, and provides continuity in learning from preschool to Transition, ensuring that children are best prepared to commence formal schooling. The curriculum provides a consistent approach across all schools through high quality teaching and learning programs focusing on developing a solid base for literacy and numeracy, and English oracy. The curriculum addresses five key areas in children’s development: identity, communication, wellbeing, learning and thinking, and connectedness, including how to interact fairly and respectfully with others. 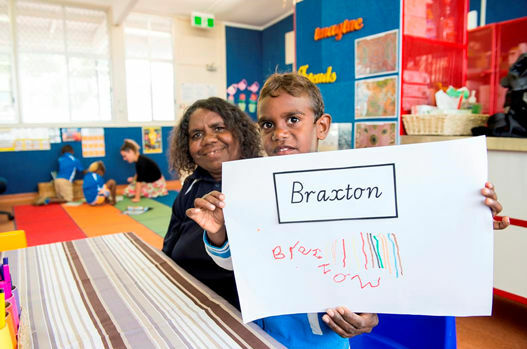 The focus on developing spoken English will be particularly useful for preschool teachers in remote communities where Indigenous children enrol with English as their second, third or even fourth language.